Licensed clinical psychologist Arthur Ciaramicoli has seen firsthand how empathy and cognitive behavioral therapy can correct distorted thinking and trigger our own neurochemistry to produce calm, focused energy. He details this approach to handling depression, anxiety, and addictions in his book The Stress Solution: Using Empathy and Cognitive Behavioral Therapy to Reduce Anxiety and Develop Resilience. In this guest blog, which includes an excerpt from the book, Ciaramicoli focuses on our current presidential race in the United States and shows how dangerous it can be when we perceive with prejudice instead of empathy. We have witnessed the worst presidential campaign in history. But fortunately the prejudices of millions of Americans have been revealed. Why do I say “fortunately”? Because I have been writing about the tremendous focus on appearance and wealth in our society, to the detriment of building character and integrity, since 2000, when I published The Power of Empathy, and now this issue has come into the national spotlight. In that earlier book I emphasized how empathy is the key to understanding beyond the surface and to entering the heart or soul of those who may appear different on the outside. When we employ the capacity of empathy to see beyond our old conditioning — and conditioning is what prejudice is truly about — we learn that all human beings are more alike than not alike. In my most recent book, The Stress Solution, I discuss the decline of integrity and character in our society, citing research that indicates how narcissism and getting ahead at all costs have replaced our emphasis on doing service for others. NPR recently cited a study by the American Psychological Association indicating that the presidential race has caused significant stress among Americans, especially the multitude of hostile, inflammatory comments. I have always been deeply affected by prejudice. I have been called guinea and wop, asked if my family was in the Mafia, told that people like me should not go to college, and asked to not associate with certain friends because I was not of their religious background. However, the prejudice I have endured has been mild compared to the pain of those who suffer daily from distorted views about themselves. As a result of years spent trying to teach people to rewrite their prejudicial stories about themselves and others, I am keenly aware of how prejudice can spread. It can develop into embedded beliefs and cause inordinate amounts of stress. These inaccurate beliefs hamper a person’s potential by creating self-hatred and destroying their spirit. Prejudice reduces trust, creates insecurity, and causes stress between individuals, communities, and nations. Whenever our perceptions are distorted, stress is a likely by-product. I see patients on the hour five days a week. As we develop a trusting, caring relationship, people often feel free to speak spontaneously, with less inhibition than they express socially. I am continually fascinated and dismayed by the amount of stress that prejudicial thinking and behaving creates. Along with my own personal experiences, here are a few comments I’ve heard recently in my practice from people from all walks of life. Each of these statements expresses an untrue bias. When they were made, I could see visible signs of stress on each person’s face. Most people are unaware of the level of stress that such untruths create. If you’re prejudiced, you are likely afraid. The tension that prejudice causes is often seen as necessary for safety and security. Whether you have biases toward yourself or toward others, you will live with unnecessary stress. Empathy is the tool that enables us to subject these views to rational examination before they are embedded and acted on, consciously or unconsciously. Would you have the courage to challenge a colleague, friend, or family member who made any of the statements above? Most people say they would, but experience tells me this is hardly ever the case. Most individuals want to avoid conflict and feelings of discomfort, so they change the subject or just remain quiet. Among the greatest abilities any human being can possess are the abilities to tolerate and learn from differences and to address conflict directly, truthfully, and tactfully. These are among the benefits of knowing how to communicate with empathy, which teaches us how to relate with honesty and sensitivity and lessens the likelihood of a defensive reaction. How many people do you know with these skills? If you were willing to learn these skills and teach them to your children, you would unquestionably diminish the stress and tension in our world today. Prejudice toward oneself or others is often the result of a lack of awareness combined with a fragile sense of self. This tendency may be taught and reinforced by the milieu we live in. We mirror the behaviors we see, and our empathy grows or contracts in response to our early encounters. For example, if as a child you spoke and were ignored, if you wanted to tell your parents about your day but they were too preoccupied to understand, or if, when you were hurt, you were told to control your tears, you probably began to avoid expressing enthusiasm or pain, and you would tend to observe your parents and other authority figures to learn what behaviors they deemed acceptable. Children long for approval, and when it is not forthcoming, they seek any means to shore up their self-worth. If a parent is prejudiced toward an ethnic group or a particular religion, a child learns to feel and think the same way. The child may not suffer low self-esteem but will likely be influenced by distorted perceptions. Over time, this closed way of thinking limits possibilities and friendships with a diverse group of people, ultimately leading to insecurity or anger in the presence of people who are targets of the prejudice. Sixty-one percent of Americans currently believe that race relations in this country are poor. The percentages have been rising monthly, causing stress and pessimism among blacks and whites alike. In addition, our world is currently rocked by terrorism and the hatred that leads human beings to believe that they exemplify the right and only way to live and that they must convert others to the same way of life by force, if necessary. It isn’t just extremists in poor nations who are guilty of this way of thinking; it is people in our daily lives who think and perceive in the same general way, even if they do not resort to physical violence. Research at the University of Queensland tested a previous finding that people have much stronger empathy toward those of their own race or ethnic background. The study, conducted by Dr. Ross Cunningham, involved Chinese students new to Australia. The students were shown videos of Chinese and Caucasian actors receiving a painful or nonpainful touch to their cheek and questioned as to the level of empathy they felt for the actors. Those students who indicated that they had more contact with students of other races showed higher levels of empathy than did those students who had contact only with other students like themselves. The students with higher empathy had more daily exposure to those from different backgrounds — not necessarily close relationships, but simply more contact. In essence, familiarity had a significant impact on empathy, regardless of race or ethnic background. Empathy increases and stress decreases with exposure to other groups of people. When we offer our concern and compassion only to those in our own family, neighborhood, religion, or country, it is often because of our lack of exposure to others. Empathy is born out of a humble love, one that cares for all people, knowing that we are all more alike than dissimilar. We live in a time when prejudice is growing, while empathy and trust in others are declining. Americans have fewer friends than we used to, and when stress dominates our existence we are compromised and cannot perceive accurately. I speak to people daily who are overly stressed by the constant barrage of comments made by the presidential candidates, many fearing how either leader will govern, as they have little faith in either candidate’s character and ethical standards. What can we do to overcome this fear? Rather than buying into the rhetoric, commit to being responsible to your country and to your world by becoming poignantly aware of your biases. We all have them; no individual grew up in a completely objective world. When we are open to determining the truth, we become change agents for fairness, ethics, and integrity. This election is symbolic of a problem; the tendency to discriminate has been growing for several years. Our ability to empathize with one another has been declining as our emphasis on appearance and materialism has grown. I stated in The Stress Solution: “We work too much, sleep too little, love with half a heart, and wonder why we are unhappy and unhealthy.” I have received more comments on that statement than anything else in the book. Why? Because we know it is true. Empathy slows us down to use the thinking part of the brain to obtain the facts, the truth in any situation and in regard to any person or group. In the process empathy changes our brain chemistry for the better, producing calm chemicals that allow us to perceive more accurately and realistically. We need, more than ever, to slow down, to commit to obtaining the facts — not judgments based on old conditioning or sound bites from greedy, politically motivated candidates. If you do this you will become one of the many who will help return our country to the one that was once admired by all the world for its steadfast commitment to character, decency, and freedom for all. 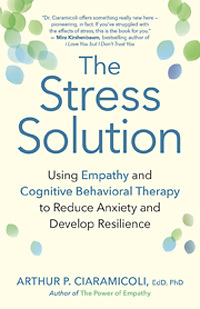 Arthur P. Ciaramicoli, EdD, PhD, is the author of The Stress Solution. He is a licensed clinical psychologist and the chief medical officer of soundmindz.org, a popular mental health platform. He has been on the faculty of Harvard Medical School and chief psychologist of Metrowest Medical Center. The author of several books, including The Power of Empathy and Performance Addiction, he lives with his family in Massachusetts. Visit him online at www.balanceyoursuccess.com.